San Val Precision has recently added five new, state-of-the-art machine tools to expand our precision machining capability. Two new Puma 240 CNC lathes with a 13.8” diameter x 21.6” length turning capacity, a 5,000-rpm spindle, and rapid traverse on both axes, augment our CNC turning department. 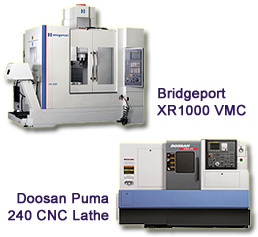 Three new Bridgeport VMC’s compliment our robust CNC milling department with full 4th-axis capabilities, powerful spindles and large machining envelopes. At San Val Precision, our commitment to the latest in CNC machining technology translates into consistent quality, reliable deliveries and very competitive pricing for our customers. Trust San Val Precision to remain ahead of the pack when it comes to extraordinary value and superior customer service in the precision machining industry.